Earlier this month I had the good fortune to attend Material, a conference that explores the concept of the web as a material and all the intrinsic characteristics that entails. The variety of talks provided new perspectives on what it means to build for — and with — the web, and prompted me to note down a few related thoughts. What it means for something to be of the web has been discussed many times before. While the technical test can be reasonably objective — is it addressable, accessible and available — culturally it remains harder to judge. But I don’t know about you, I’ve found that certain websites feel more webby than others. It’s a quality that’s hard to define — you know it when you see it — but the websites that best exude this characteristic tend to be more personal in nature. Sites like Natsukashii where Sally captures her memories of Japan by illustrating the beautiful manhole covers and train stamps she found there; monthly.mx, Sam’s monthly playlists of the best new music; Anna’s site that documents the capabilities of game console browsers, or Jeremy’s most recent and personal of projects, The Gęsiówka Story. Written by his relative Edward Kossoy and previously locked away inside a PDF, this webpage documents the liberation of 348 Jewish prisoners from the Gęsiówka concentration camp in 1944. And it would be remiss for me not to mention Bradshaw’s Guide, a project where I’m slowly republishing an 1866 guide to Britain’s nascent railway network. These types of projects are what Russell Davies would term unmonetisable enthusiasms; deep pools of novelty and enthusiasm. But even without a niche premise, other personal websites fit this mould too, not least the humble weblog. Bloggers I enjoy most tend to have a relaxed, open and conversational quality to their writing. Like for example Susan, who has been rediscovering her love of drawing and sharing the sketches she’s produced using prompts from the book Draw Every Day, Draw Every Way . Al has also been sharing his illustrations on the web, but on Instagram. Whereas Susan displays her work within the context of her own tastes, Al’s beautiful and captivating sketches are undermined by the straight-jacket of Instagram’s one-size-fits-all layout, the same used by Kim Kardashian and Gavin Williamson MP. As such, I feel less of a connection to his work. Is it the overwhelming presence of an individual’s personality then, that marks something out as being more of the web? And if that’s true, might it follow that only sites entirely crafted by an individual can be considered a valid contribution? Maybe what I consider to be web-like is a symptom of being old enough to remember the original promise of the web; that of a genuinely distributive medium for which anyone could contribute and everyone’s work had equal value. If ever there was a misunderstanding of the web’s inherent nature perhaps it was this. We believed its universality would enable equality, yet we ignored an important caveat: a barrier to entry whose height increases each time a new generation of developers passes through it. That WordPress powers over 30% of web speaks to a desire for people to publish online, but it also suggests a failure of the medium that doing so requires the services of intermediaries who, powered by network effects, soon find themselves consolidating power and influence. But is this dynamic anything new? For every web designer bemoaning the existence of services like WordPress or Squarespace, you’ll find a barista shaking their fist at Starbucks, or a couture fashion designer bemoaning the emergence of Primark. While we may decry the existence of fast food and fast fashion, there’s no denying the fact that large commercial entities will deliver products that are far more accessible and affordable. 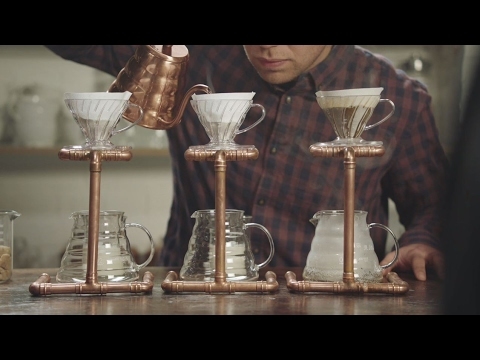 This McDonald’s advertisement pokes fun at artisanal and overpriced alternatives to its own range of coffees. Convenience comes with a cost of course. Although hidden from (or ignored by) the consumer, there are negative consequences of producing products at scale. And as we are now discovering, the same is true of the web. As producers become more concerned with scale, they give greater consideration to process and costs than the eventual outcome. This is why I find myself conflicted by the popularisation of design systems. Sure, the commoditisation of design has its benefits, but these initiatives tend to be internally facing and to the benefit of larger organisations. That some of the best examples frequently turn up within the types of organisations I don’t care for, only fosters my disdain — as do advocates of design systems making literal comparisons to McDonald’s. Is the rapid manufacture of humdrum products at low cost what the industry now aspires to? Of course it is — that’s capitalism! Fortunately, some see scale as a means of delivering value for customers rather than internal teams; build a design system with accessibility at its heart, and the products developed with it should be more accessible too. My earlier characterisation of the IndieWeb could be dismissed were its technologies adopted by commercial products with its protocols and standards in effect treated more like plumbing. I’ve unpicked quite a few threads here, perhaps only to tie myself in knots! But to conclude, I think for the web to maintain its material strength, its cultural weave needs to include a healthy mix of the random, the bizarre and the novel alongside its more sterile and streamlined ventures. And sometimes I worry this is getting harder to achieve without empowering the middlemen who are undermining the fabric of the web in the first place. With thanks to Sam Morris, Susan Robertson and Cennydd Bowles for feedback on an earlier draft of this post.